Although the expression “strictly for the birds” has often been directed at my more obscure flights of fancy the recent birthday of my cousin John gave new wings to a childhood interest in birds of prey. To wit the noble art of Falconry. When it comes to hunting I have nothing against catching one’s supper, provided the quarry is dispatched quickly, cleanly and then consumed. Judging by the fine set of canines inherited from my ancestors, it’s something we have been doing for years. However, I have no truck with pointless, vain glorious pursuits such as fox hunting with hounds, so eloquently described by Oscar Wilde as “the unspeakable in full pursuit of the uneatable.” When it comes to a social jolly what’s wrong with point to point? Apart from the culling of deer, even the modern gun is a bit over the top. While the workmanship is to be admired such destructive power in the hands of the amateur is truly terrifying. Far better, I say, to become one with nature and earn your roast partridge. With that in mind I bundled Whimsy the dog into the back of the old Land Rover and headed out to the wilds of Kent with cousin John. Our destination was The Hawking Centre in Doddington Place Gardens where ancient and modern meet and meld. The origins of falconry are lost in the mists of time, but suffice it to say we have been training birds of prey for centuries. It is said The Pharoahs kept desert falcons and the tradition of hunting with eagles is still kept alive among the tribes of Mongolia. At The Hawking Centre our curiosity was rewarded with the chance to handle and fly some magnificent raptors, including a mighty Chilean Eagle, an Eagle Owl with huge yellow eyes and a sociable Harris Hawk – in the wild they hunt in packs! Under the watchful eye of falconer Aaron we roamed the woods and park land with birds flying freely to and fro, lured by the tasty morsels held firmly between fingers and thumbs of our sturdy gloves. A scene familiar to our medieval forefathers no doubt. Not only do hawking centres teach us about ancient traditions, they have a modern role in preserving these increasingly rare creatures through breeding programmes. The birds also help control pests like pigeons and gulls at airports and other sites. Fired by renewed enthusiasm I have recently aquired two new books to add to my small falconry collection. They can be found in The Library under Birds. Hawking and Falconry for Beginners by Adrian Hallgarth is bang up to date on the subject. I have also swooped on the more weighty Falconry and Hawking by the late, great Philip Glasier, regarded in his lifetime as our foremost expert. I heartily commend them both to you for a fascinating insight into this remarkable world. 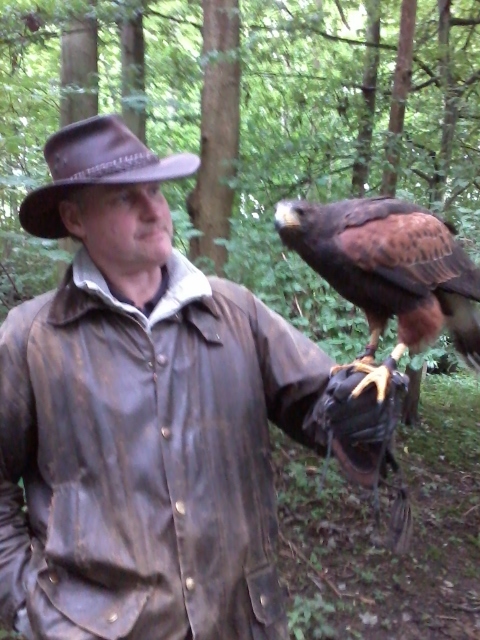 John – eye to eye with a Harris hawk.